You won't regret it~Especially, if you choose carefully among the many plants offered on the Internet and at local nurseries. More are available ~I saw rudbeckias, coreopsis cultivars, gaura, ex-asters, salvias, agastaches and rhododendrons for sale this morning when I ran to the local big box store for fence posts. Keep in mind that even if they are native to where you garden~They might not grow in your garden. Or, they might grow too well. It's true, many natives can be thuggish, aggressive or colonizing. But, please don't use invasive to describe their behavior. I like to save that powerful word for exotics that are on the state noxious and invasive species list. Instead, I refer to them as colonizers, aggressive natives or just plain thugs. If you garden on a difficult spot like I do, then aggressive native plants are not a problem. They are welcome. In fact, they are my fall garden workhorses. They're essential to my garden and being rough and tumble wildflowers means they're unfazed by shallow clay soil. They bloom until a killing frost and they attract bumbles, butterflies and other critters to the garden. They also make me happy. What more could you ask for in a garden plant. So, plant more natives~They really do make sense. 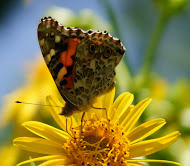 In case, I haven't convinced you consider this: native plants are adapted to our unique garden climate; they're less susceptible to pests and disease; we generally don't have to greatly modify the soil characteristics; and, they provide beauty for humans and food and shelter for visiting butterflies, bees and other pollinators. But, if you garden on rich, deep soil, colonizing native plants, like woodland asters, False Dragonhead, Goldenrods, Mistflower and River Oats might not be what you want to invite into the garden. Remember, they spread by, seed, roots and rhizomes to make a large and dramatic impact. Trust me there are many native plants that are not thugs~You might want to consider planting a sweet native like Salvia azurea. It occasionally reseeds but isn't a thug by any stretch of the imagination. So go ahead, plant more natives, just be sure to research what makes sense in your garden. Welcome to Clay and Limestone's Wildflower Wednesday celebration. I am so glad you stopped by. WW is about sharing and celebrating wildflowers from all over this great big, beautiful world. Join us on the fourth Wednesday of each month. Remember, it doesn't matter if they are in bloom and, it doesn't matter if we all share the same plants. It's all about celebrating wildflowers. Please leave a comment when you add your url to Mr Linky. Hi Gail - we've been pondering similar themes this month but in slightly different ways. Today I'm wondering whether the 'wildflowers' I saw with pleasure in Seattle are actually that welcome. I'm also pondering 'right plant, right place' for another article and making a similar point to you here re a 'thug' when it's in the right place can actually be useful when planted a little outside its comfort zone. I like native plants that spread in clay soil since I have the space! Your goldenrod and asters are beautiful! Natives are so easy to grow and laugh at the trying conditions, are covered with happy pollinators and are beautiful. You are preaching to the choir here! I love your photos, especially the first one! I am guilty of calling some plants, like obedient plant invasive. I wish I had room for it to do its thing, though. I am excited about all the natives I have made homes for, but am wondering if any of them will reseed into neighbors' yards. I don't think they should cause problems, though. What would wildflowers be without the bees? Beautiful images each and every one. A plant cannot be invasive, if it is native, as in born here. Invaders come from elsewhere. I've learnt the slow hard way, that the fynbos on the mountain, dies a slow sad 'cooked to' death in our garden in the valley. If I wasn't a native plant lover you would convince me Gail..of course I did wish I had done my research before planting a few...I love to experiment so I live with their aggressive nature or move them to less than ideal conditions so they are not as thuggish...you have hit on so many of my favorites...great pictures especially of the Obedient...I have accepted their aggressive behavior and we live in harmony...although I have to exert a bit of control now and then but it is worth it to see the hummers, butterflies and bees go wild!! 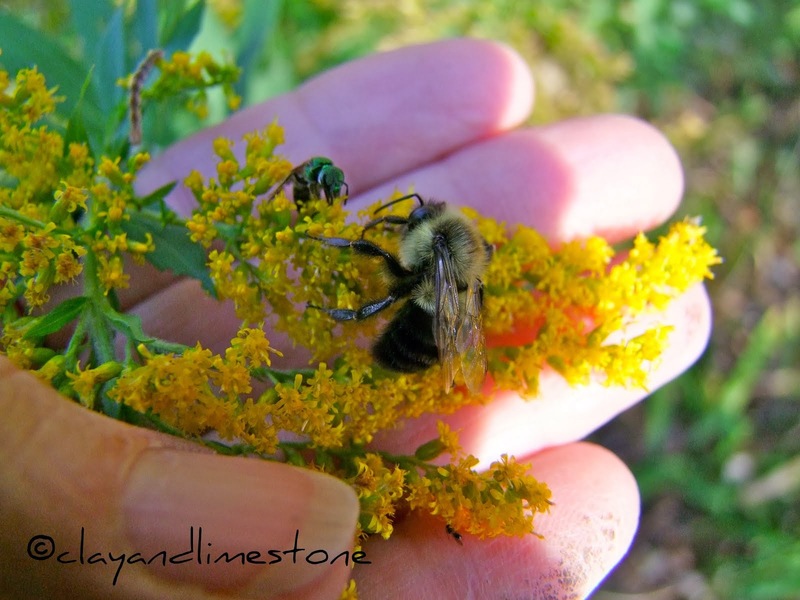 Your pictures say it all, Gail--nothing makes the pollinators happier than natives! Since I have plenty of space, I'm more than happy to invite these generous self-seeders into my garden. Not invasive at all! I'll join the WW party later today, as soon as I've had time to download my photos. Count me in this month! I don't have a bunch of natives blooming but I do have a few good photos to share. I saw your mistflowers which reminded be that I haven't seen mine yet this year. I'm afraid the Bermuda grass may have eaten it. I hate that stuff! I'll have to add some obedient plant one of these days. I think I have the space for it! Natives are welcome in my garden. Sometimes they come uninvited. No problem. I keep them in control. I adore thugs . . . with exception to birds ie Blue Jays . . . in the plant world for they are the only ones to survive the tenacious and dangerously invasive non-native bishops weed I inherited here. We should never refer to natives as invasive . . . as Diana so aptly remarks . . . the conquerers always come from elsewhere. Beautiful photos along with great mantra and message Gail. Have been a fan of natives since way back. Loce all your plants, ep. the copmbo of Northern sea oats and an ex-aster (is that smooth-leaved?). Gail, I've only heard of bee's knees until today when I saw them in your blog! More natives are just the trick when we're trying to cope with this strange weather. It's so lovely to see so many creatures winging in for visits in my garden knowing they're filling up before they head down your way. Gail, I've been absolutely abysmal at posting this summer but finally got my act together and put together a wildflower post. Thanks for all the work you do promoting these wonderful plants. 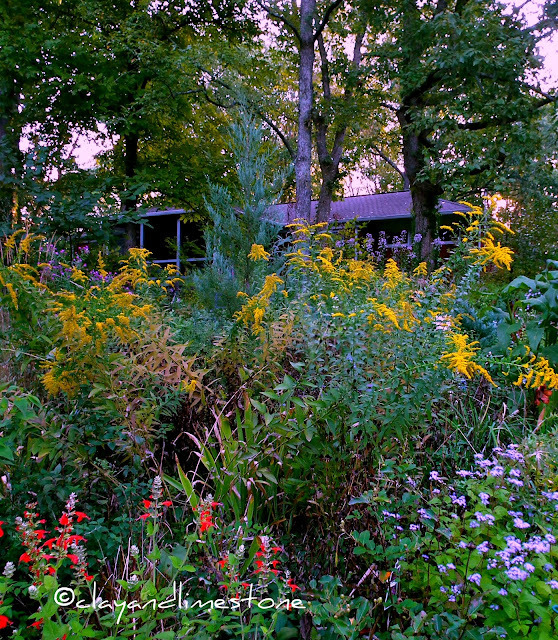 Just looking at your beautiful garden is reason enough to start gardening with natives. gail, i just noticed a strange link from me in mr. linky to a post i didn't intend to include! i wondered why you commented on that post last wildflower wednesday! i must have cut and pasted the wrong thing. hopefully i got it right this time. 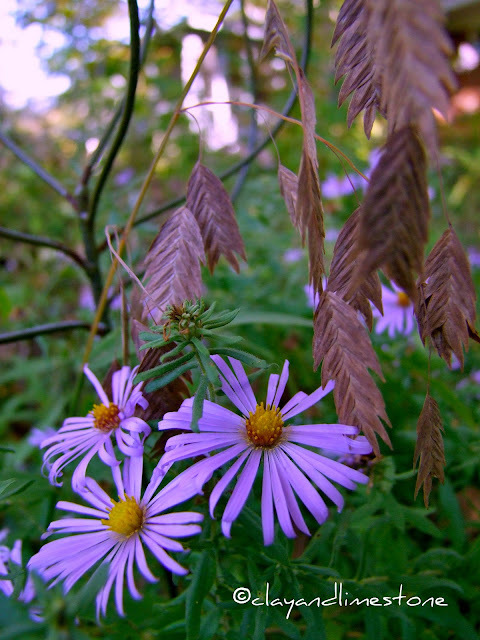 winker's firewheel is a great wildflower -- i think you'll love it! I am so lucky because I live near Nasami Farm, the big propagation part of the New England Wildflower Society. They are open spring and fall weekends offering a wonderful selection of native plants suitable for our area. I took lots of roadside photos this summer, but I really have to get better at IDs. Gail, I consider the obedient plant a thug in my garden. The rascal goes everywhere trying to dominate the bed it is in. This is the time of year that I appreciate it though. It is so pretty when it is blooming. Happy WW. Thanks for hosting Wildflower Wednesday - and the information you provided about native plants! Lovely lighting in your photos. You are so right about those aggressive natives. In the right situation, they are wonderful, but they need to be watched closely when added to the garden. I had to banish white snakeroot, Ageratina altissima, from my garden because of the prolific seeding. 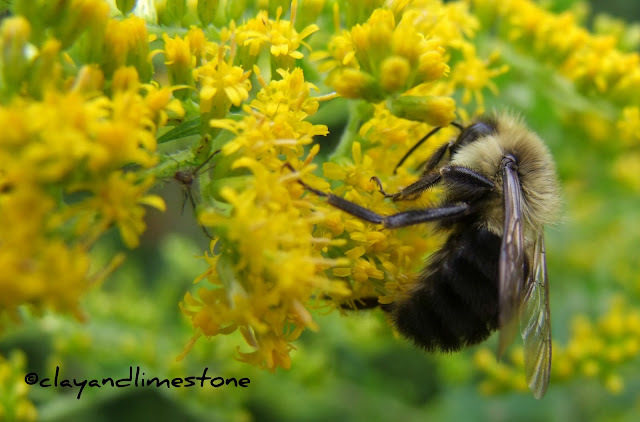 Pollinators love native plants. I've got some photos of the bees on the wild asters for this Wildflower Wednesday. I recognize some of those natives. My natives were happy to join your party. Thanks. I agree Gail, in my book there is no such thing as an invasive native. I think the Physostegia is gorgeous! Natives can be exhuberant, or robust maybe, but not invasive. I wouldn't mind a few exhuberant natives filling in some of the bare patches here at the moment! Our dry summer conditions though tend to limit the spread of a lot of plants, especially in areas that aren't irrigated. I live in clay country too and there are so many awesome natives that thrive in these conditions. Love all the photos and natives! Awesome photos! My first time linking up here! LOVE that last photo of the dark bee! My first time linking up with you for Wildflower Wednesday! My first link, though, isn't to my wildflower post :( - technical error - so I tried again and the second link will get you there! Thanks, Gail, for hosting! I agree, gotta plant more natives! Your flowers are so lovely, Gail. I'm featuring fruits again, since that is what I have. Love those natives, I hope I will have more blooming next year! I clicked on the link too soon as well, I hope it goes to the right post. Lots of gorgeous examples of native wildflowers here. I love that last image with the bee backlit with a golden glow. How wonderful! Thank you for encouraging people to plant more natives! It's excellent advice! Amazing photos to go with your sound advice. Great post, Gail! Fall here in coastal NE Florida and my front garden looks like a butterfly festival is happening. Bought my place 8 yrs ago & proceeded to replace unnatural, chemical-dependent lawn grass with native flowering plants. Have reaped the benefit all summer & now into fall. Saw several dozen Monarch butterflies go from egg to caterpillar to chrysalis to butterfly. Plant milkweed! So happy I found you blog! My garden is packed with natives and they never fail to please. I've found rudbeckia fulgida much tougher than my 'Goldsturms'. I'm looking forward to my diervilla getting bigger. They are an incredibly tough native shrub. Great pictures!! A wonderful post, and so on target.